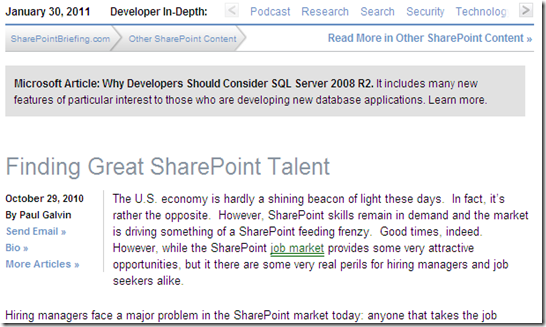 Here is another article I wrote for the good people at SharePoint Briefing entitled “Finding Great SharePoint Talent”. The article tries to give some advice on how to find truly good and well-experienced people when you’re looking to expand your staff. This entry was posted in Consulting and tagged hiring, SharePoint on January 31, 2011 by Paul Galvin. My two cents: talent is not just about experience on a specific platform. After all, nobody has more than ten years experience on SharePoint. If you have AJAX experience, you can make a good SharePoint 2010 designer, maybe better than somebody who worked on SharePoint 2007 for 3 years. And if you are a BPM expert, this can be very valuable with the new Visio-SharePoint integration.